Hi, my name is Fumito! I organize several Japan deep-knowledge tours. Let’s enjoy Japan one step deeper! If you have acquaintances in Japan, you have a big advantage. They will make you feel as if you are a local by guiding you or giving further information. And then your trip will be far more interesting and fun. I will help you discover and do authentic experiences. The tour was amazing! Amazing value for an amazing price. The tour guide really caters the tour to what you are most interested in! We even got to see the inner market quickly which was a hectic but interesting experience. It was great to sample all the different kinds of food at the food market! Absolutely fantastic tour with Mari & Takuto. We spent a week in Tokyo and this was the highlight of our trip. 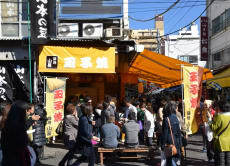 We wandered through the outer markets and Mari & Takuto showed us many different foods and traditional food products. We were able to sample so many of them--many of which we would have been intimidated to try without our guide filling us in on what they were. Walking through the fish market was equally impressive. Mari & Takuto shared many interesting facts and history with us. Takuto was so kind to take photos for us and their hospitality was A+! Thank-you, Mari & Takuto!! The host Taku san is very informative and he speak english fluently. He is very friendly and even buy us some his favorite snacks, he understand about the market because he visiting the market for his previous job so he can explain to us about anything that we ask. 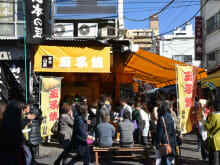 Overall, if you want to visit tsukiji fish market I would recommend Taku san. We had a lovely tour through the fish market. Our hosts were very informative but also very flexible wanting to know what we wanted to learn about and tailored the tour to us. We had a wonderful time exploring trough all the different seafood and other local Japanese delicacies then heading into the fish market to see all the insanely large fishes and catch the daily lives of thie worlds biggest fish market. We loved trying all the different Japanese food And and thy even took us to a temple to teach us their rituals. After we got some great recommendations for sushi restaurants off the tourist trail. Our hosts were so kind and accommodating and we loved our time with them. Would definitely recommend. We really enjoyed the visit and the kind explanations of our guide, unique experience, we will come again!